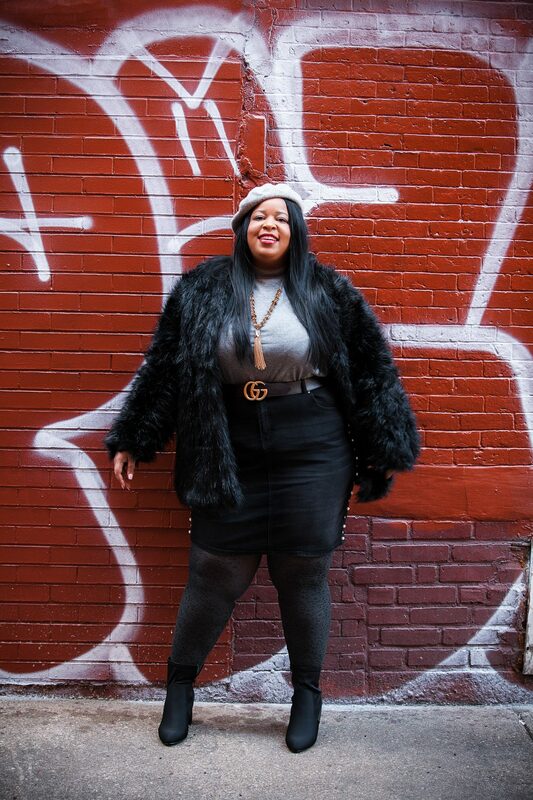 When I last did an outfit post, I told you this wouldn’t be the last time you see me wearing plus size faux fur! Today I bring a new brand that I haven’t featured on the blog called Roamans! Roamans is a brand that pretty much carries every article of clothing, shoes, and accessories you need! With boots that go up 12ww and furs that drop down to the floor, it’s hard not to fall in love with their variety. Today, I wanted to get into something a little different: Black Faux Fur! This look truly encompasses how I was feeling this day –> classy boss! With the variety of trends on Roamans, I had to start with this boss black fur! It’s super warm and it’s now become a work staple! Ya ya ya, I know you’re probably calling me extra but it makes me feel good. Second, I decided to layer it with the Audrey Turtleneck from Roamans as well. Very soft and is a great winter staple because you wear it with pantsuits or skirts just like I did. Lastly, I wanted a bootie that had a moderate heel but I could also wear it with denim or body con dress. The Sus Bootie was the perfect fit and had ample room around the ankles! If you’re someone who is wide feet like me, please indulge in Roamans W and WW selections! So how are you feeling this boss look? I feel uber accomplished and ready to hit the town!